We like to keep important topics affecting our world close at hand. We will post news, articles, comments, and other publications from our students and other contributors. Please be sure to indicate how your topic relates or affects us all. A project is a temporary endeavor undertaken to provide a unique product or service." This is the definition from the 2000 edition of The Guide to the Project Management Body of Knowledge (PMBOK®) published by the Project Management Institute (PMI®). Project Management Institute's Guide to the Project Management Body of Knowledge for a definition of project management. It defines project management as "the application of knowledge, skills, tools, and techniques to project activities to meet project requirements." In the project management triangle we are concerned with the management of the project's time, cost, and scope. These concerns lead us to manage the project's quality, risk, communications, integration, schedule, performance, stakeholder needs, desires, requirements, and expectations. It is interesting to note that when PMI changed the PMBOK to its latest version, it changed this definition from "… meet or exceed project requirements" to "… meet requirements." This is a bit of a departure from the approach of giving the customer a little something extra. In the past it was considered good practice to give the customer a little more than was asked for. The customer was thought to be pleased at getting something for nothing. Today we realize that these little extras frequently come with a price. The little extra software routine we added may have maintenance problems that the customer will have to pay for later. This is not to say that improvements and cost savings should not be brought up to the customer and discussed. It does mean, however, that we should not give customers anything extra without discussing it with them. A project is temporarily organized endeavor to accomplish a specified non-routine or low volume task. Although projects are not repetitive, they take significant amount of time to complete and are large-scale or complex enough to be recognized and managed as separate undertakings. Management of a project differs in several ways from management of a typical business. The type of techniques required to manage the projects depends on the complexity of the projects. For small projects, Gantt charts are adequate whereas for large and complex projects, the critical path method (CPM) or the program evaluation and review technique (PERT) would be more effective. During this phase, the organization realizes that a project may be needed or the organization is requested to propose a plan to perform a project for some customer. During this phase, the project manager plans the project to a level of detail, sufficient for initial scheduling and budgeting. If the project is approved, then detailed scheduling and budgeting is done in this phase. During this phase, a detailed project definition such as the work breakdown structure (WBS) is examined. A WBS is a document similar to the bill of material and divides the total work into major packages to be accomplished. Personal and other resources necessary to accomplish the project the project are then made available for all or a portion of the project’s duration through temporary assignments from other parts of the organization or by leasing resources or subcontracting portions of the project. During this phase the various activities planned are completed as per the schedule, utilizing the allotted resources. This is the phase, during which project is terminated or disbanded after completion. The personnel who were working in the project are assigned back to the irregular jobs or to other jobs in the organization or to other projects in this phase. Proportion of the company’s work that is performed by projects. The scope and duration of the project. The capabilities of the available personnel. The preferences of the decision makers. There are four options available in choosing an appropriate organization for projects. In functional organizations, functional departments are formed that specialize in a particular type of work such as production and sales. These functional departments often are broken into smaller units that focus on special areas within the function. Top management may divide project into work tasks and assign them to the appropriate functional units. The project is then budgeted and managed through the normal management hierarchy. A project may be handled through the organization as described above, except some one is appointed to coordinate the project. The project is still funded through the normal organization and the functional managers retain responsibility and authority to their portion of the project work. The project coordinator meets with the functional managers and provides focus and impetus for the project and may report its status to the top management. 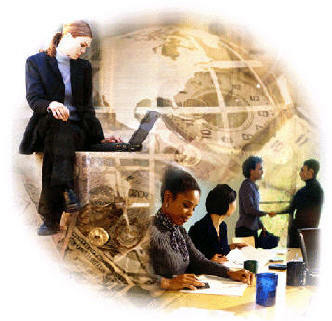 In a matrix organization, a project manager is responsible for completion of the project and often assigned a budget. The project manager contracts with the functional managers for completion of specified parts of the project. The functional managers assign work to employees and coordinate work within their areas. The project manager co-ordinates project efforts across the functional units. A particularly significant project that will have a long duration and require the full time efforts of a group may be run by a project team, specially constituted for that purpose. Personnel are assigned full-time to the project and are physically located with other team members. The project has its own management structure and budget as though it were a separate division of the company. Professionals in the industrial or business field would be very well aware that a Project is different from a regular production. Organizing and implementing for a new production set up or expansion or for new product in short is termed as ‘Project’ which may require expertise and a time frame ranging from a few months to few years even. The professional in charge of the entire activity at the employee level is designated suitably as ‘Project Manager’ or General Manager Projects or even Executive Director Projects.. Once the project is executed and commissioned the production starts and the Project Manager is made either to look after the production unit set up or shifted to another project. A project consists of unique time-consuming activities performed in a sequence. Each project has some definite completion time and the cost associated with all the activities of the project till its completion is called project cost. Here there are many complex tasks, involving a multi-disciplinary approach. The tasks have a deadline. Some projects generate a product as an output like a ship or an aircraft. Here, during the transformation process, there is immobility of the product, it remaining in the fixed position. These are large-scale complex products or services which cannot be physically moved. The project is managed by a project team. Project team allocates resources like men, materials, machines etc. to different activities. Some materials do get consumed in the process, whereas some machines and manpower are capable of being re-deployed in other project activities. The following is an illustrative list of projects. Setting up a nuclear power plant. Construction of civil works like bridges, buildings, roads etc. Computerization of human resources inventory. Building a modern hospital or stadium for sports meets. Implementation of a change due to technological advance in manufacturing, packaging, materials handling etc. Competition stimulated projects related to cost reduction, productivity improvement etc. In other words, project form suits inter- disciplinary sets of activities to be performed under severe time and cost constraints, which may result in penalties if there is time and cost overruns with time wages of labor and jacked-up prices of equipment, project approach is finding favor all the more. Projects have a short life-cycle with a definite beginning and a definite end. During the progress of the project resources requirements are not uniform. They may not be more in the beginning and may be much more during the build-up to leveling of slowly to the extent of cut-down towards the end. Resource allocation is one of the major challenges of project planning and controlling. The above description makes it clear that manpower deployment is a tricky business here. The deployed manpower from other departments might lack commitments and also affects the family life of the persons. The manpower may not be cut out for the specialized tasks to be carried out for the project. Temporary manpower looks for alternative jobs when the project is nearing completion. Even during the project’s life, the manpower tries to be prepared for the next activity. All this may result into time over-run. The matrix form of organization is suitable when multiple projects are being handled. Here, there are functional specialists who hold the resources and allow the project manager to co-ordinate these resources through his subordinates. A functional specialist coordinates with several project managers. There is therefore co-ordination across functional departments. However, the principle of unity of command is violated, and hence there is a need for a better rapport between the functional specialist and the project manager in his line capacity. Each project consists of a cost of activities having inter- dependence. Some activities cannot start till the predecessor activities are completed. The project delayed results in cost over-run. Scheduling and controlling of project activities by OR techniques like PERT/CPM is therefore vitally important. Professionals in the industrial or business field would be very well aware that a Project is different from a regular production. Organizing and implementing for a new production set up or expansion or for new product in short is termed as ‘Project’ which may require expertise and a time frame ranging from a few months to few years even. The professional in charge of the entire activity at the employee level is designated as ‘Project Manager’. Once the project is executed and commissioned the production starts and the Project Manager is made either to look after the production unit set up or shifted to another project. The project manager’s job is important and challenging. He is responsible for getting work performed, but often has no direct, formal authority over most of the people who perform the work. He must often rely on broader knowledge of the project and skills at negotiation and persuasion to influence participants. He may have the assistance of a staff if the project is large. Manage the project’s scope to define the goals and work to be done, in sufficient detail to facilitate understanding and correct performance by the participants. Manage the human resources involved in the project. Manage-communications to see that, the appropriate parties are informed. Manage-time by planning and meeting a schedule. Manage-quality so that, the project’s results are satisfactory. Manage-cost so that, the project is performed at the minimum practical cost and within budget if possible. Managing a project can be a complex and challenging assignment. Since projects are one-of-a-kind endeavors, there may be little in the way of experience, normal working relationships or established procedures to guide participants. A project manager may have to co-ordinate diverse efforts and activities to achieve the project goals. Persons from various disciplines and from various parts of the organization who have never worked together may be assigned to the project for different spans of time. Sub-contractors who are unfamiliar with the organization may be brought in to carry out major portions of the project. The project may involve a large number of inter-related activities performed by persons employed by any one of several different sub-contractors. For the above reasons, it is important that the project leaders have an effective means of identifying and communicating the planned activities and the ways in which they are to be inter-related. An effective scheduling and monitoring method is absolutely essential for the management of a large project. Network scheduling methods such as, PERT and CPM have proven to be highly effective and valuable tools during both the planning and execution phases of projects. Project planning includes all activities that result in a course of action for a project. Planning begins with setting well defined objectives such as implementing a new management information system. Also, planning involves decision making regarding resources to be committed, completion, priorities of activities etc. Areas of responsibility must be identified and assigned. Time and resource requirements to perform the work activities must be forecasted and budgeted. Planning also involves establishing project boundaries and identifying controllable and uncontrollable variables that must be managed. Also, the performance criteria should be stated related to the project objectives and in measures of time, cost and quality characteristics. Project scheduling establishes times and sequences of the various phases of the project. In project scheduling, the project manager considers the various activities of an overall project and the tasks that must be accomplished and relates them coherently to one another over the projects time horizon. Techniques for scheduling projects include Gantt charts and network techniques such as PERT and CPM. Gantt charts do not reflect the inter-relationship among resources or the precedence relationships among project activities. Network techniques overcome this shortcoming of Gantt charts by including precedence relationships. Four alternative methods of project evaluation and selection are discussed in this article. The first is a simple additive method for assessing the worth of a project called the payback period. The remaining three methods (internal rate of return, net present value, and profitability index) are all discounted cash flow techniques. The payback period (PBP) of an investment tells us the number of years required to recover our initial cash investment. Although this measure provides a rough guide to the liquidity of a project, it is a poor gauge of profitability. It falls short as a measure of profitability because it (1) ignores cash flows occurring after the expiration of the payback period, (2) ignores the time value of money, and (3) makes use of a crude acceptance criterion, namely, a subjectively determined cut off point. The internal rate of return (IRR) for an investment proposal is the discount rate that equates the present value of the expected net cash flows with the initial cash outflow. If a project’s IRR is greater than or equal to a required rate of return, the project should be accepted. The net present value (NPV) of an investment proposal is the present value of the proposal’s net cash flows less the proposal’s initial cash outflow. If a project‘s NPV is greater than or equal to zero, the project should be accepted. The profitability index (PI), or benefit-cost ratio, of a project is the ratio of the present value of future net cash flows to the initial cash outflow. If a project’s PI is greater than or equal to 1.00, the project should be accepted. When two or more investment proposals are mutually exclusive, so that we can select only one, ranking proposals on the basis of the IRR, NPV, and PI methods may give contradictory results. If a conflict in rankings occurs, it will be due to one or a combination of the following three project differences: (1) scale of investment, (2) cash-flow pattern, and (3) project life. In every case, the net present value rankings can be shown to lead to the correct project selection. In short, if net present value rankings are used, projects that are expected to add the greatest increment in dollars value to the firm will be chosen. A potential problem with the internal rate of return method is that multiple internal rates of return might occur for non-conventional projects whose cash-flow streams show multiple changes in sign. When there are multiple rates of return, an alternative method of analysis must be used. Capital rationing occurs any time there is a budget ceiling, or constraint, on the amount of funds that can be invested during a specific period, such as a year. When capital is rationed over multiple periods, several alternative (and rather complicated) methods can be applied to the capital rationing problem. If capital is to be rationed for only the current period, selecting projects by descending order of profitability index generally leads to a firm value. It is important to monitor projects continually to help ensure project success. Therefore, companies should perform progress reviews followed by post completion audits. The use of photography technique is like holding up a mirror to your own workplace to highlight embarrassing bits you would prefer that others do not see. A kitchen of a restaurant is supposed to be kept very clean. However it is not so in many cases, therefore a photographic approach maybe very helpful to keep the kitchen very neat and clean. A series of photographs of different sections of the kitchen can be taken over time which will be helpful to point out in which ways the conditions in the kitchen can be improved. The photographs also help in idea generation and planning for improvements. These photographs act as a solid record of the improvement that has taken place in the kitchen since the first photograph was taken. Thus, cleanliness of the kitchen provides good working conditions and good food to the customers. Sportsmen are often made to see the videos of their previous matches which help them point of the flaws in their game. Once these flaws are pointed out, they can be corrected through proper planning. These videos help in the improvement of player’s performance, thus increasing his efficiency and importance as a team member. Quality Circle is one of the employee participation methods. It implies the development of skills, capabilities, confidence and creativity of the people through cumulative process of education, training, work experience and participation. It also implies the creation of facilitative conditions and environment of work, which creates and sustains their motivation and commitment towards work excellence. Quality Circles have emerged as a mechanism to develop and utilize the tremendous potential of people for improvement in product quality and productivity. Quality Circle is a small group of 6 to 12 employees doing similar work who voluntarily meet together on a regular basis to identify improvements in their respective work areas using proven techniques for analyzing and solving work related problems coming in the way of achieving and sustaining excellence leading to mutual upliftment of employees as well as the organisation. It is "a way of capturing the creative and innovative power that lies within the work force". Quality Circle is a form of participation management. Quality Circle is a human resource development technique. Quality Circle is a problem solving technique. From "I don’t care" to "I do care" Continuous improvement in quality of work life through humanisation of work. People get to learn additional skills. Individual Vs Team – "I could not do but we did it"
Total involvement of people at all levels. It took more than two decades for the quality control concept to get acceptance in India, after its introduction in Japan. This may be due to the differences in the industrial context in the two countries. Japan needed it for its survival in a competitive market. India had a reasonably protected, sellers market, with consequent lethargy towards efforts to improve quality and productivity. However, with the policy of liberalisation of economy and privatisation of infrastructure development, contexts changed. The concept now needs to be looked upon as a necessity. Business Process Re-engineering, if implemented properly can make any business successful. Business Process Re-engineering, like any other process and business idea has its drawbacks but this idea is constantly revised and constantly implemented through the various industries. The only way to improve Business Process Re-engineering is to learn from other companies mistakes and to gain competitive advantage over others. Business Process Re-engineering can save a company from huge financial drawbacks, like in the case of Ford where Ford re-engineered their business and manufacturing process from just manufacturing cars to manufacturing quality cars, where the number one goal is quality. This helped Ford save millions on recalls and warranty repairs. Ford has accomplished this goal by incorporating barcodes in every one of their parts and scanners to scan for any missing parts in a completed car coming off of the assembly line. This helped them guarantee a safe and quality car. They have also implemented Voice-over-IP or VoIP to reduce the cost of having a meeting between the branches. Business Process Re-engineering is a successful business process. If implemented in the proper way, it can save businesses millions and therefore giving the business a competitive edge without sacrificing quality for price. If a manufacturing company can master the skill of being efficient then they can automatically be more customer friendly and effective. Efficiency is not just about being efficient at the production floor level but the management level also has to be efficient. Brainstorming is a process for developing creative solutions to problems. It works by focusing on a problem, and then deliberately coming up with as many solutions as possible and by pushing the ideas as far as possible. One of the reasons it is so effective is that the brainstormers not only come up with new ideas in a session, but also spark off from associations with other people's ideas by developing and refining them. Gather the participants from as wide a range of disciplines with as broad a range of experience as possible. This brings many more creative ideas to the session. Write down a brief description of the problem - the leader should take control of the session, initially defining the problem to be solved with any criteria that must be met, and then keeping the session on course. Encourage an enthusiastic, uncritical attitude among brainstormers and encourage participation by all members of the team. Encourage them to have fun! Write down all the solutions that come to mind (even ribald ones). Do NOT interpret the idea; however you may rework the wording for clarity's sake. Do NOT evaluate ideas until the session moves to the evaluation phase. Once the brainstorming session has been completed, the results of the session can be analyzed and the best solutions can be explored either using further brainstorming or more conventional solutions. possibilities as possible, and break down preconceptions about the limits of the problem. The leader should keep the brainstorming on subject, and should try to steer it towards the development of some practical solutions. Once all the solutions have been written down, evaluate the list to determine the best action to correct the problem. One approach is to seed the session with a word pulled randomly from a dictionary. This word is a starting point in the process of generating ideas. When the participants say they "can't think of any more ideas" then give them about 15 more minutes as the best ideas sometimes come towards the end of long thought out thought processes. Brainstorming can either be carried out by individuals or groups. When done individually, brainstorming tends to produce a wider range of ideas than group brainstorming as individuals are free to explore ideas in their own time without any fear of criticism. On the other hand, groups tend to develop the ideas more effectively due to the wider range of diversity. Keep all the generated ideas visible. As a flip chart page becomes full, remove it from the pad and tape it to a wall as that it is visible. This "combined recollection" is helpful for creating new ideals. If the brainstormers have difficulty in coming up with solutions, you may have to reinstate the problem. When you are sure the brainstorming session is over, it is time to select a solution. By using a show of hands (or another voting method), allow each person to vote for as many ideas on the original list as they want. Note that they only have one vote per generated ideal. Write the vote tallies next to the ideal. You can use a different color than the ideal to help it stand out. Once the voting is completed, delete all items with no votes. Next, look for logical breaks. For example, if you have several items with 5 or 6 votes, and no 3 or 4 and only a couple of 1 and 2, then retain only the 5 and 6 votes. The group can help to decide the breaking point. Now, it is time to vote again. Each person gets half number of votes as there are ideals left. For example is you narrowed the number of generated ideals down to 20, then each person gets 10 votes (if it is a odd number, round down). Each person will keep track of his or her votes. The scribe should again tally the votes next to the ideal, only this time use a different color. Continue this process of elimination until you get down to about 5 ideals. Often, you will have a couple of ideas that tie, but having it diagramed out makes it much easier to make a decision. Godrej Industries embarked on its total quality management (TQM) journey in April 1995. Every employee of the company was exposed to the principles of TQM during a series of awareness programmes held over a nine-month period. We have extended the TQM's scope in the last two years to cover our business partners, suppliers, carrying and forwarding agents, distributors, etc. Cross-functional teams that work on improvement of processes that have the maximum impact on achieving the strategic objectives of the business. Voluntary teams composed of shop-floor employees solve problems in a structured manner in their own work area. Total = Quality involves everyone and all activities in the company. Quality = Conformance to Requirements (Meeting Customer Requirements). Management = Quality can and must be managed. TQM = A process for managing quality; it must be a continuous way of life; a philosophy of perpetual improvement in everything we do. Companies who have implemented TQM include Ford Motor Company, Phillips Semiconductor, SGL Carbon, Motorola and Toyota Motor Company. ISO 9000 is a Quality System Management Standard. TQM is a philosophy of perpetual improvement. The ISO Quality Standard sets in place a system to deploy policy and verifiable objectives. An ISO implementation is a basis for a Total Quality Management implementation. Where there is an ISO system, about 75 percent of the steps are in place for TQM. The requirements for TQM can be considered ISO plus. In short, implementing TQM is being proactive concerning quality rather than reactive. Quality can and must be managed. Everyone has a customer and is a supplier. Processes, not people are the problem. Every employee is responsible for quality. Problems must be prevented, not just fixed. Quality improvements must be continuous. The quality standard is defect free. Goals are based on requirements, not negotiated. Life cycle costs, not front end costs. Management must be involved and lead. Plan and organize for quality improvement. The basic principles for the Total Quality Management (TQM) philosophy of doing business are to satisfy the customer, satisfy the supplier, and continuously improve the business processes. How do you satisfy the customer? Why should you satisfy the supplier? The first and major TQM principle is to satisfy the customer--the person who pays for the product or service. Customers want to get their money's worth from a product or service they purchase. If the user of the product is different than the purchaser, then both the user and customer must be satisfied, although the person who pays gets priority. A company that seeks to satisfy the customer by providing them value for what they buy and the quality they expect will get more repeat business, referral business, and reduced complaints and service expenses. Some top companies not only provide quality products, but they also give extra service to make their customers feel important and valued. Within a company, a worker provides a product or service to his or her supervisors. If the person has any influence on the wages the worker receives, that person can be thought of as an internal customer. A worker should have the mind-set of satisfying internal customers in order to keep his or her job and to get a raise or promotion. Often in a company, there is a chain of customers, -each improving a product and passing it along until it is finally sold to the external customer. Each worker must not only seek to satisfy the immediate internal customer, but he or she must look up the chain to try to satisfy the ultimate customer. A second TQM principle is to satisfy the supplier, which is the person or organization from whom you are purchasing goods or services. A company must look to satisfy their external suppliers by providing them with clear instructions and requirements and then paying them fairly and on time.It is only in the company's best interest that its suppliers provide it with quality goods or services, if the company hopes to provide quality goods or services to its external customers. A supervisor must try to keep his or her workers happy and productive by providing good task instructions, the tools they need to do their job and good working conditions. The supervisor must also reward the workers with praise and good pay. The reason to do this is to get more productivity out of the workers, as well as to keep the good workers. An effective supervisor with a good team of workers will certainly satisfy his or her internal customers. One area of satisfying the internal suppler is by empowering the workers. This means to allow them to make decisions on things that they can control. This not only takes the burden off the supervisor, but it also motivates these internal suppliers to do better work. The third principle of TQM is continuous improvement. You can never be satisfied with the method used, because there always can be improvements. Certainly, the competition is improving, so it is very necessary to strive to keep ahead of the game. Some companies have tried to improve by making employees work harder. This may be counter-productive, especially if the process itself is flawed. For example, trying to increase worker output on a defective machine may result in more defective parts. Examining the source of problems and delays and then improving them is what is needed. Often the process has bottlenecks that are the real cause of the problem. These must be removed. Workers are often a source of continuous improvements. They can provide suggestions on how to improve a process and eliminate waste or unnecessary work. There are also many quality methods, such as just-in-time production, variability reduction etc. that can improve processes and reduce waste. The Cause and Effect diagram (Ishikawa) or the fishbone diagram as it resembles the skeleton of the fish, is a tool to detect the root cause of a problem. It is widely used as it helps identify the main and associated causes leading to an effect (symptom) or a problem. It is one of the seven tools used in quality control - Cause-and-Effect diagram, check sheet, control chart, flowchart, histogram, Pareto chart, and scatter diagram. Fosters creativity through brainstorming exercises. Cause & Effect Diagrams are also known as Fish Bone Diagrams. The box and line can be thought of as the head and spine of the fish. Write down the exact problem you face in detail. Where appropriate identify who is involved, what the problem is, and when and where it occurs. Write the problem in a box on the left hand side of a large sheet of paper. Draw a line across the paper horizontally from the box. This gives you space to develop ideas. Next identify the factors that may contribute to the problem. Draw lines off the spine for each factor, and label it. These may be people involved with the problem, systems, equipment, materials, external forces, etc. Try to draw out as many possible factors as possible. If you are trying to solve the problem as part of a group, then this may be a good time for some brainstorming! Using the 'Fish bone' analogy, the factors you find can be though of as the bones of the fish. For each of the factors you considered in stage ii, brainstorm possible causes of the problem that may be related to the factor. Show these as smaller lines coming off the 'bones' of the fish. Where a cause is large or complex, then it may be best to break the it down into sub-causes. Show these as lines coming off each cause line. By this stage you should have a diagram showing all the possible causes of your problem. Depending on the complexity and importance of the problem, you can now investigate the most likely causes further. This may involve setting up investigations, carrying out surveys, etc. These will be designed to test whether your assessments are correct. Cause & Effect diagrams provide a structured way to help you think through all possible causes of a problem. This helps you to carry out a thorough analysis of a situation. The classical approach (also called the Ishikawa approach) is based on the principle of 'cause and effect'. In this technique, every problem is regarded as the effect and must therefore have its cause(s). So to solve a problem, the classicist would exhaustively list down the possible causes and set about modifying their states hoping that the 'effect' would disappear. For instance, if an automobile mechanic is faced with the problem of a car not starting, he uses the Ishikawa approach and draws this 'fish-bone' diagram. He then uses his own search algorithm and visits each of these causes till his 'effect' disappears. ·The problem solver must list down his causes exhaustively. If he is unable to do so, he may never come close to the solution. Focus on a problem based on priority or criticality. The next step is to categorise the problem. For instance, let us consider “High Employee Turnover”. Draw a diagram wherein this problem is picturised (far right as illustrated in the diagram). Nevertheless, this might not be the actual problem. According to Ishikawa it could only be a symptom of the actual problem that will be detected in due course. Alongside the symptom or the problem, draw an arrow. This arrow serves as the main path that branch out to sub causes/problems. Later new categories and problem will branch out from the arrow as represented in figure – 2. The four causes for high employee turnover i.e. management, locations, market place and benefits can be determined through brainstorming exercises. Include as many people as possible in these brainstorming exercises. This improves the reliability of the Cause and Effect Diagram. More the number of people more accurate are the categorisation of the causes for a problem. By identifying down the main problem and its causes one could simply draw a Cause and Effect diagram. However identifying the sub causes and mapping them to the main causes it equally critical. Sub causes help determine the effect of the problem to a higher degree of accuracy. They also help improve the visibility of the reasons for the problem. Thus, by identifying the sub causes the management can take clear steps to iron out the problems. Brainstorming for the causes or the sub cause must be comprehensive. Simply put, the larger the fishbone diagram, the easier it is to picture the root cause of the problem. This however demands the entire organisation’s participation. If coaxing the entire organisation to participate is tedious, involve at least those employees who understand the problem, should participate. The causes, the sub causes and the sub-sub causes must be quantifiable. Causes beyond the organisations’ control like weather conditions or legal hassles should not be entertained. For a fishbone diagram to be readable and reliable the causes must be identifiable. Often vague causes might appear while constructing a fishbone diagram. Then it is recommended these causes be branched into identifiable causes. Simply put they must be broken down into simpler causes. Vague or unclear causes should be avoided in the fishbone diagram. They must be subjected to detailed analysis and their effects studied. A brainstorming exercise can help determine most causes. However if there is concern over narrowing down to causes/sub causes amongst employees, voting could solve the dilemma. Those with the highest majority are then put on the fishbone diagram. Overlooking a cause/sub cause might create an unreliable fishbone diagram. Thus conduct repeated brainstorming sessions to pen all possible sub causes that lead to a specific cause. Often causes are relative. Hence create the fishbone diagram with relative causes as branching from one another. This improves the visibility of the cause and its effect. It might also facilitate a common solution to related causes. Once the fish bone diagram is complete, create clear action plans for solving the cases. Since few causes are of relative nature, actions plans must focus on catering to them as well. In the globalisation world, the environmental issues seem to be one of the most important topics. The pollution created in any manner such as air emission, effluent, land contamination, etc., have several impacts on people throughout the world. Upon this pressure, the International Organization for Standardization has developed the environmental management standards which is known as the “ISO 14000 Series”. The International Organisation for Standardisation was founded to promote the development of international manufacturing, trade, and communication standards. The Organisation is composed of member bodies from more than 110 countries. ISO standards exist for all industries except those related to electrical and electronic engineering. All ISO standards are voluntary. However, countries and industries often adopt ISO standards as requirements for doing business, thereby making them virtually mandatory in these cases. ISO 14000 is a series of standards for environmental management. The ISO 14000 standards are divided into two categories: Organisation standards and Product and process standards. There is a great deal of interest on ISO 14001. Asia and Europe have the greatest number of companies certified (registered) to this standard. Companies in North America are also implementing ISO 14001. The most important part of ISO 14000 is the environmental management system (EMS). An EMS allows a company to manage, measure and improve the environmental aspects of its operations. It does this by setting specific goals and checking progress toward meeting those goals. Continual improvement of the EMS is achieved through system audits. Initially, the organizations top management should have commitment and define the policy on EMS which is used for the direction of implementing and improving its EMS. identify the environmental aspects of its activities and specify those which have significant impacts on the environment. identify legal and other requirements to which the organization involved. establish objectives and targets of its activities having impacts to environment. establish environmental programmes for achieving its objectives and targets. Define roles, responsibilities and authorities for facilitating EMS effectively. communicate to the staffs at each level for the importance of conformance to the environmental policy; provide appropriate training to personnel performing the tasks to gain their knowledge and competence. establish and control documentation relating to EMS. control operations and activities to meet the specified objectives and targets. identify potential accidents and emergency situations for preventing and mitigating the environmental impacts that may be associated with them and periodically test such procedures where practicable. monitor and measure its operations and activities against the organization’s plans. identify non-conformance and take action to mitigate any impact caused. record the on-going activities of the EMS. The organization’s top management should review and continually improve its EMS, with the objective of improving its overall environmental performance. Implementing these five elements will enable any Organisation to achieve comprehensive environmental management. Obtaining better surroundings as well as providing protection to the potential emergency. Reducing environmental cost because of appropriate environmental management such as resources management, waste management, etc. Self-Declaration. This is the process of declaring that the company has an environmental management system (EMS) that meets the standard. Third Party Certification. The company may have an independent third party audit their EMS to the ISO 14001 standard. A recognised ISO body can act as a third party in this case. It generally takes about 12 to 18 months for companies to get ISO 14000 certified. The time depends on the organisations existing EMS, size and internal resources. Costs vary widely depending on the size of the facility/business unit being certified. Approximately 90% of the costs are for the implementation of the EMS. Beckhard, R. & Harris, (1987). Organizational Transitions: Managing Complex Change. (2nd ed.) Reading, MA: Addison­Wesley. Beckhard, R. & Pritchard, W. (1992). Changing the Essence. San Francisco: Jossey­Bass. Bennis, W. (1989) On Becoming a Leader. Reading, MA: Addison Wesley. Benns, W., Benne, K, & Chin, R., Eds. (1985). The Planning of Change. 4th Ed., New York: Holt, Rinehart, & Winston, 98­105. Bennis, W. & Nanus, B. (1985). Leaders. New York: Harper & Row. Brager, G. & Holloway, S. (1992). "Assessing the Prospects for Organizational Change: The Uses of Force Field Analysis." Administration in Social Work. 16(3/4), 15­28. Chaudron, D. (1992). "How OD can help TQM." OD Practitioner. 24(1), 14­18. Chaudron, D. (1993, June). Organization Development Does not Equal Total Quality Management. Presentation to the San Diego Organization Development Network. Cohen, S. & Brand, R. (1993). Total Quality Management in Government. San Francisco: Jossey­Bass, Inc.
Ezell, M., Menefee, D., & Patti, R. (1989). "Managerial Leadership and Service Quality: Toward a Model of Social Work Administration," Administration in Social Work. 13(3/4), 73­98. Gilbert, G. (1992). "Quality Improvement in a Defense Organization," Public Productivity and Management Review. 16(1), 65­75. Hyde, A. (1992). "The Proverbs of Total Quality Management: Recharting the Path to Quality Improvement in the Public Sector," Public Productivity and Management Review. 16(1), 25­37. Martin, L. (1993). "Total Quality Management: The New Managerial Wave." Administration in Social Work. 17(2), 1­15. Milakovich, M. (1991). "Total Quality Management in the Public Sector," National Productivity Review. 10, 195­213. Nanus, B. (1992). Visionary Leadership. San Francisco: Jossey­Bass. Osborne, D. & Gaebler, T. (1992). Reinventing Government. Reading, MA: Addison­Wesley. Packard, T. (1989). Participation in decision making, Performance, and job satisfaction in a social work bureaucracy. Administration in Social Work. 13(1), 59­73. Packard. T. & Reid, R. (1990). "OD in a Fire Department: Lessons in Using Parallel Structures and Institutionalization," Consultation. 9, 167­184. Pruger, R. & Miller, L. (1991). "Efficiency," Administration in Social Work. 15(1/2), 42. Rapp, C. & Poertner, J. (1992). Social Administration: A Client­Centered Approach. New York: Longman. Reid, R. (1992). Personal communication. Robey, D. (1991). Designing Organizations 3rd ed., Homewood, IL: Irwin, p. 42. Senge, P. (1990). The Fifth Discipline. New York: Doubleday Currency. Sugarman, B. (1988). "The Well­Managed Human Service Organization: Criteria for a Management Audit," Administration in Social Work. 12(2), 17­27. Swiss, J. (1992). "Adapting TQM to Government," Public Administration Review. 52, 356­362. Tichey, N. (1983). Managing Strategic Change. New York: John Wiley & Sons. Vroom, V. and Yetton, P. (1973). Leadership and Decision Making. Pittsburgh: University of Pittsburgh Press.